I always talk about how beautiful it is and how I love to SCUBA dive, so it was an easy decision for her to make. She chose Maui because it was the only major island I hadn’t been to yet. We wanted to share a new experience together. We split our stay in half, each in a different city. First we stayed in Kihei, which is a long strip on the leeward (or “dry”) side of the Haleakala volcano. The highlight of staying in Kihei was tied between driving scooters down the coast and eating delicious food at our favorite restaurant downtown. Then we rented a car and drove to Lahaina, where we spent the second half of our trip. Lahaina is the most popular city on the island for tourists because of the abundance of shops, restaurants, beaches, and hotels. 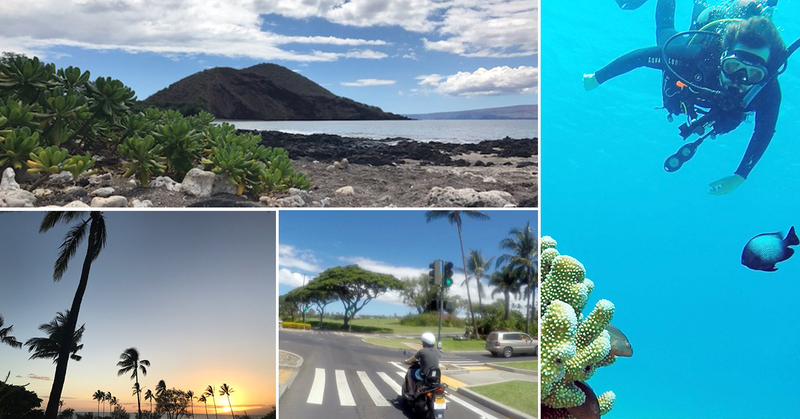 The highlight of staying in Lahaina was definitely the SCUBA diving and snorkeling. Our SCUBA guide took us to Airport Beach. It has a huge coral reef and tons of aquatic life to view through our goggles. This was Leeza’s first time breathing under water and she loved it! After that we drove up and down the coast finding the best spots to hop in the water and relax on the sand. I kept expecting at least one little thing to go wrong, but the whole birthday vacation went without a hitch. It was sunny every day and we wore swimsuits almost the entire time we were there. We had a very relaxing and fun time in Maui. I hope to one day show Leeza what the other islands have to offer. I don’t want to forget to mention that we also got a puppy! We met Kona in Eugene the day before our flight, and we kept thinking about her during the whole trip. We felt like new parents away from the baby. It was actually really nice because we weren’t sad on our last day in Hawaii, knowing we would come home to our new puppy.